I had the most fantastic time at Panama City Beach with the most amazing people, but it feels good to finally get back into the swing of things. You know, spending endless hours in the kitchen whipping up yummy dishes, staying up until 4 am with my eyes glued to Pinterest and food blogs, literally calculating calories for my upcoming recipes in my sleep. Ahhhh, life is back to normal. So, before I dive into the deets of this big pan of low carb, creamy guilt free heaven that you’re currently looking at, I have to let out some bad news. I returned from vacay with a little more than I bargained for. I came home with 6 extra pounds of “why did I eat all of that again” sitting pretty around my midsection. What’s funny is that I knew that I was bound to gain some weight. After all…those 4 plates that I piled high at the Chinese buffet and that entire sharing size bag of chocolate covered mangoes (nomnom) that I devoured on my lonesome had to account for something. HA. Boy was I wrong. But, you know what, it’s okay…it’s totally okay. Those ugly numbers staring back at me are just more motivation to get back into my healthy(ish) lifestyle and get the pounds under control, right? Which brings us this wonderful pasta dish that’s total comfort food and totally okay to sort of binge on because it’s not even pasta and is actually a vegetable. Like, I’m telling you guys right now that this is the real deal. If you’ve never ever had spaghetti squash before, this is for you. It is your time to shine my friend! I can’t think of a better way to get acquainted with such a fab veggie than by diving into a big bowl of garlicky, nutritious, flavorsome, Garlic Shrimp Spaghetti Squash wrapped in a creamy Greek Yogurt Alfredo sauce. Preheat oven to 400 degrees Fahrenheit. Carefully slice spaghetti squash down the middle and remove seeds with a spoon. Coat both halves of spaghetti squash with olive oil, sea salt and pepper. Place on baking sheet lined with aluminum foil and bake for 40 minutes or until fully cooked. Allow to cool for 10 minutes. Spray a medium sized pot with cooking spray and saute garlic until slightly brown on medium heat. Add almond milk and Greek yogurt to the pot and gently whisk to combine. Once sauce begins to boil slightly, add Parmesan cheese and reduce heat to low. Mix periodically until cheese has fully melted then remove pot from heat. Spray large saucepan with cooking spray and add shrimp. Season with garlic powder, sea salt, black pepper, lemon juice and cook for approximately 5 minutes on both sides until shrimp is pink. Add Greek yogurt Alfredo and spaghetti squash to saucepan and toss to combine. Enjoy! Can you substitute almond milk for something else? Do you think that you could make this ahead and freeze a few servings, or do you think it would ruin the texture / flavours? Also - same question for the cauliflower chicken pot pies? I'm a generally terrible cook and don't have enough time to make several meals a week for lunches, etc. So I'm always on the look out for a great tasting dish I can make on Sunday to last me all week! What a delicious recipe! My husband and both loved it and I had leftovers for lunch that my coworkers were drooling over! Thank you for this delightful addition to our dinner rotation! Hello! I only have nonfat greek yogurt. I was wondering if you knew how this would affect the dish. I really want to try this, but can't run to the store! Let me know :) Thank you so much for your response. Oh! I also have half & half and whipping cream.... Maybe one of those is a better substitute than the nonfat yogurt? Thanks!!! Haven't cooked squash before, when placing on tray does it cook face up or down? Hmm, I've only tried this recipe with Greek yogurt but perhaps you could try regular plain full fat yogurt? I'm not quite sure how this would effect the creaminess/texture though! Great recipe! And so full of flavor. I wouldn't have thought to put squash, shrimp, and a white sauce together, but it really worked. It was also very filling for not having a starch in it. Thanks for sharing. Hi! About how many cups are in a serving? Hi Amanda, nutrition info is based on a cup serving! Made the garlic shrimp spaghetti squash recipe. What a delicious, easy to make meal. Even my husband liked it. After dinner I told him what the sauce ingredients included. He was amazed that it ws so good since he doesn't like Greek yogurt. I've never made spaghetti squash before, but I found this on Pinterest and made it my first adventure. :D SO glad I chose your recipe- this came out perfectly and tasted delicious. I added roasted tomatoes and basil, loved it. A new favorite! I'm SO glad to hear that your first spaghetti squash experience was a positive one, Kathleen! I'm not sure where I messed up! My sauce was more garlic butter than cream. Seems like the yogurt curdled? What happened! Lol. I only have non fat Greek yougurt, should I try it? Those shrimp look so good! And since I've alwauys liked spaghetti squash tossed with a little parmesan, I have to try your sauce. I'm a spaghetti squash fan -- and so is the rest of my family. My husband prefers it to pasta because he can eat more and I won't needle him with "haven't you had enough?" This looks phenomenal! Haha that's definitely where I am with the whole spaghetti squash thing. I love pasta either way but sometimes those extra carbs just aren't happenin'! This looks amazing! Those shrimp look fantastic! 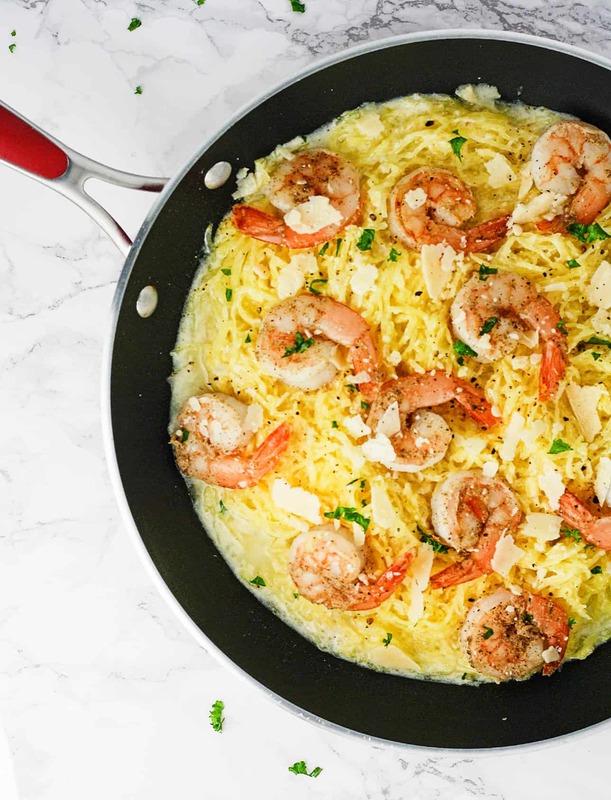 I've never made spaghetti squash in the summer but I love the sound of this dish! It looks soo good. I'm feeling inspired! What a wonderful idea, and such a nice change from all the zoodle recipes! Gotta love my zoodle recipes but you're right, Sue. It's always great to have a variety to keep meals from getting boring! Girl, vacay happens. But this!? This is the PERFECT way to get back on track. Full flavor and low carb lovin'. I've gotta try this soon!